ARLINGTON, VA; NOV 16, 2011 – In advance of PBS presentations at the TCA (Television Critics’ Association) Press Tour, PBS announced today highlights of its broadcast schedule for winter/spring 2012, including two just announced miniseries: CLINTON, a profile of the 42nd president, from AMERICAN EXPERIENCE and FINDING YOUR ROOTS WITH HENRY LOUIS GATES, JR., an exploration of the backgrounds of famous Americans. Headlining the broadcast schedule on January 8 at 9:00 p.m. and continuing for seven weeks is the eagerly awaited return of MASTERPIECE CLASSIC’s “Downton Abbey, Season 2.” The miniseries opens as World War I changes lives, tests alliances and brings new drama to Downton. See a new preview, released today on pbs.org. From MASTERPIECE MYSTERY!, premiering at 9:00 p.m. May 6 and continuing through May 20, Sherlock Holmes stalks again in the three-part “Sherlock, Series 2.”This modern version, set in 21st-century London, stars Benedict Cumberbatch (War Horse) as the go-to consulting detective and Martin Freeman (The Hobbit) as his loyal friend, Dr. John Watson. At the TCA/PBS Press Tour January 4-5, PBS will showcase CLINTON: AMERICAN EXPERIENCE. Premiering on President’s Day, February 20 (9:00-11:00p.m.) and continuing Tuesday night (2/21, 8:00-10:00 p.m.), the two-part special, announced today, revisits the tumultuous presidency of William Jefferson Clinton through candid interviews with journalists, insiders and adversaries, including former White House Press Secretary Dee Dee Myers, former White House Counsel Bernard Nussbaum, former White House Chief of Staff and current Secretary of Defense Leon Panetta and Deputy Chief of Staff Harold Ickes, among others. Part of AMERICAN EXPERIENCE’s critically acclaimed presidential collection, CLINTON joins the ranks of previous profiles ranging from LBJ to Ronald Reagan, FDR and Theodore Roosevelt. See an advance clip of the show here. Also, just being announced today is FINDING YOUR ROOTS WITH HENRY LOUIS GATES, JR., with the renowned cultural critic and Harvard scholar who also will be in attendance at the TCA/PBS Press Tour. Premiering Sunday, March 25 at 8:00 p.m., the 10-part series delves into the genealogy and genetics of famous Americans, combining history and science in a fascinating exploration of race, family, and identity in today's America. Professor Gates shakes loose captivating stories and surprises in the family trees of Kevin Bacon, Robert Downey, Jr., Branford Marsalis, John Legend, Martha Stewart, Barbara Walters and Rick Warren, among many others. Premiering April 11 at 10:00 p.m., AMERICA REVEALED takes viewers on a four-hour journey high above the American landscape to reveal the country as it’s never been seen before. With technology expert and communications attorney Yul Kwon (“Survivor: Cook Islands”) serving as host, this exciting new PBS series travels through time, space and systems to reveal a nation of interdependent and intricately interwoven networks that feed and power the nation, produce millions of goods and products, transport people great distances and come together to make America work. 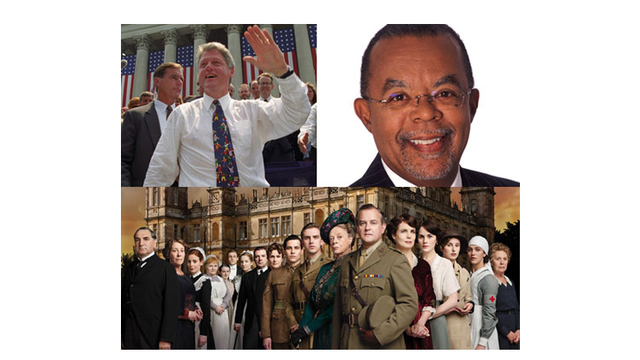 PBS Arts programming continues on Friday nights following the inaugural PBS Fall Arts Festival. GREAT PERFORMANCES premieres Anna Deavere Smith’s one-woman show “Let Me Down Easy,” a theatrical exploration of matters of the human body, on January 13 at 9:00 p.m. As in her acclaimed earlier plays, Smith develops the work by interviewing an eclectic range of people and performing as the interviewees in their own words. On January 27 at 9:00 p.m., the 90-minute “Tony Bennett: Duets II” (w.t.) captures the legendary singer with a diverse roster of contemporary artists, including Lady Gaga, John Mayer, Michael Buble, k.d. lang, Sheryl Crow, Willie Nelson, Queen Latifah, Norah Jones, Josh Groban, Andrea Bocelli, Faith Hill, Alejandro Sanz, Carrie Underwood and the late Amy Winehouse in her last recording. Additionally on the PBS Arts docket, MICHAEL FEINSTEIN’S AMERICAN SONGBOOK, SEASON 2 returns with three episodes starting Friday, February 3 at 9:00 p.m., leading viewers across America and through musical history with a variety of surprising guest stars. Premiering February 24 from 9:00-11:30 p.m., GREAT PERFORMANCES gives viewers a front row seat to “Memphis,” starring the original Broadway cast members of the 2010 Tony Award-winning Best New Musical. Also appearing are Henry Louis Gates, Jr., for his new miniseries FINDING YOUR ROOTS; Anna Deavere Smith for GREAT PERFORMANCES “Let Me Down Easy”; and David Pogue for NOVA “Hunting the Elements.” Additional talent will be announced soon. After the move of NOVA to Wednesday nights in January 2010, year-over-year ratings show that Wednesdays at 9:00 p.m. have benefitted from the move, across all demographics, with ratings among viewers aged 40-49 up 31 percent. Overall, NOVA’s 2010-2011 season ratings are up 25 percent from the '09-10 season. This winter/spring, PBS continues to pair NATURE and NOVA on Wednesday nights — and solidifies the night by adding more science and natural history programming in the 10:00 p.m. slot. NATURE, maintaining its 8:00 p.m. slot, investigates a marsupial invasion in “Kangaroo Mob” on January 11, and in “Raccoon Nation,” on February 8, considers how human beings, in an effort to outwit raccoons, may be actually making them smarter and contributing to their evolutionary success. A two-part NOVA special, “Hunting the Elements,” premieres in April, asking the question, “What are things made of?” David Pogue (“Making Stuff”) spins viewers through the world of weird, extreme chemistry on a quest to unlock the secrets of the elements. As part of the strategy of building a science and nature destination night on Wednesdays, PBS adds to the 10 p.m. slot the new multi-part science series INSIDE NATURE’S GIANTS, beginning Wednesday, January 18 at 10:00 p.m. Bringing together a SWAT team of scientists — including a comparative anatomist, a veterinary scientist and an evolutionary biologist — the series goes inside (literally) to reveal the secrets and anatomical mysteries of some of nature’s largest animals, including a sperm whale, large pythons, a great white shark, and a lion and a tiger. Beginning in January, AMERICAN EXPERIENCE premieres a slate of new and encore episodes centered on the American West on Tuesday nights, including the premieres of BILLY THE KID on January 10 and CUSTER’S LAST STAND on January 17, airing at 8:00 p.m. INDEPENDENT LENS returns Thursday, January 12 at 9:00 p.m. with “Have You Heard From Johannesburg,” a five-part series chronicling the unprecedented international movement of citizen activists who fought to bring down the system of apartheid in South Africa. Later in the spring, MASTERPIECE celebrates Charles Dickens with the MASTERPIECE/BBC co-production of the two-part “Great Expectations,” Sundays, April 1 and 8 at 9:00 p.m., starring Gillian Anderson, the Emmy-winning star of “Bleak House,” and Douglas Booth; and a production of the Dickens classic “The Mystery of Edwin Drood,” Sunday, April 15 at 9:00 p.m. The two-hour JOHNNY CARSON: AMERICAN MASTERS, airing Monday, May 14 at 9:00 p.m., offers an in-depth portrait of the undisputed king of late-night television. In exploring the career, complexities and contradictions of one of the biggest stars television has ever produced, AMERICAN MASTERS secured the Carson estate’s previously unavailable cooperation and permission — unrestricted entrée into his personal archives and perhaps Carson’s greatest legacy, all episodes of “The Tonight Show” from 1970-1992. Clues about his life and stories about his childhood and early days in the business can be found there — and in the expansive family albums and memorabilia, as well. Original interviews with friends, colleagues, his wives and the many performers who appeared, or began, on “The Tonight Show” offer additional context: Carl Reiner, Mel Brooks, Jay Leno, David Letterman, Ellen DeGeneres, Jimmy Fallon, Jerry Seinfeld and Doc Severinsen, among many others. NATURE“Cracking the Koala Code” airs Wednesday, May 16 at 8:00 p.m. and follows individual koalas from a small social group on an Australian island to reveal how a koala manages to survive and thrive on a diet poisonous to almost all other herbivorous mammals. Following at 9:00 p.m. is NOVA’s “Deadliest Tornado” (w.t. ).